Little one and I went to our local music group a few weeks ago which she really enjoys. They have a different music provider each week and most bring out instruments to play with which always go down well. 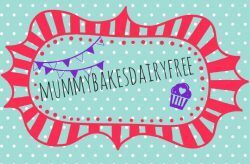 We don’t get to go every week as I sometimes end up working so we both enjoy going when we can and I got a chance to catch up with a fellow allergy mummy. Both our little ones have cmpa (cow’s milk protein allergy) and she mentioned how tricky it is as her little girl also is allergic to tomatoes. Looking over my previous blog posts I’ve realised how many of them have a tomato base. We’re fortunate that little one can eat them as it would definitely make things trickier. A tomato based sauce is an obvious alternative to creamy, dairy rich sauces. I want to try to make a wider range of meals which don’t rely on tomatoes as the base. Today’s fish risotto is a great one to try. I added beans to up the protein and chucked in some veg to make it a one bowl dinner. It is another flexible recipe so feel free to make changes, additions and omissions. You could easily make it vegan or you could add a white meat which would work well. 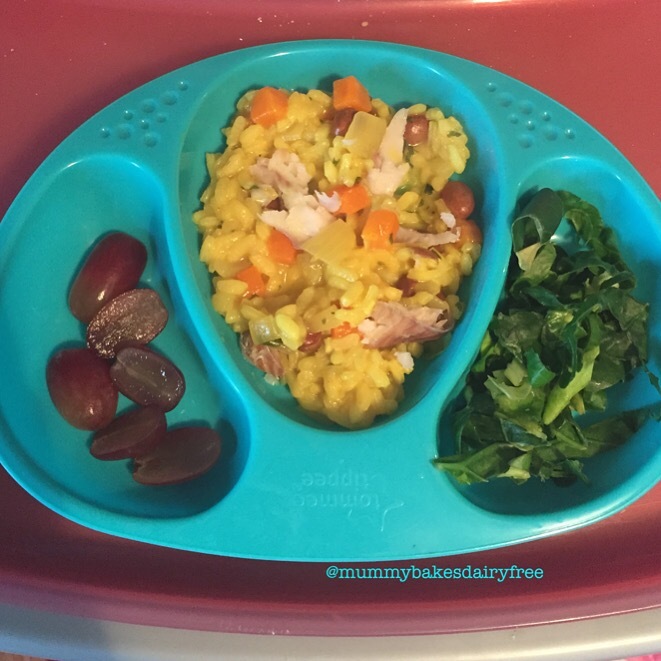 Little one really enjoyed this which wasn’t a surprise as she loves rice as a side dish. I flaked the fish into small chunks which meant she ate most of it and she enjoyed picking out the beans. It was also a fairly easy meal for her to eat herself after I loaded up a spoon. She also had a go at spooning up the risotto herself. 1. In a large saucepan heat the olive oil and then add the onion, garlic and carrot. Cook over a medium heat until soft. Chuck in the rice and stir, coating the rice thoroughly in the oil and vegetables. Cook for a few minutes. 2. Add the hot stock a ladle at a time. Stir and allow the rice to simmer gently. Once almost absorbed and another ladle of stock. Repeat until you have used almost all of the stock. 3. Before you have added the last of the stock, pour in the beans and herbs stirring until fully combined. Now add the last of the stock and cook on a low heat, until the stock is nearly all absorbed. 4. Remove from the heat and add the dairy free butter, spring greens and fish. Stir the risotto so that the ingredients are evenly distributed and pop a lid on the saucepan. Leave to settle for five minutes before serving. Before step two why not add a small glass of white wine and cook for 5 minutes. Replace the borlotti beans with your pulse of choice. Instead of white fish, cooked chicken or turkey works well.